Designed for workers inside and outside your four walls, the rugged MC909X-K offers advanced data capture options and integrated wireless, delivering true voice and data connectivity for salespeople, field repair personnel and workers on the manufacturing, warehouse or retail floor. 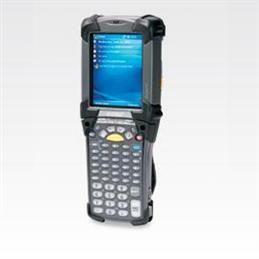 This versatile rugged hand-held mobile computer scans 1D and 2D bar codes and images, while converging voice and multimedia running on nearly any application worldwide. This single cost-effective device offers rugged construction for harsh environments, combined with support for centralised remote management, to deliver the superior reliability and performance you need to put outstanding voice capabilities in the hands of your mobile workers. Multi-mode wireless LAN/WAN/PAN and advanced data capture options enable automation of repetitive tasks inside and outside the four walls for increased productivity, response times and customer service levels. Supports converged applications world-wide through a single platform. Ubiquitous voice and data connectivity inside and outside your four walls for maximum efficiency gains. Wirelessly synchronise, print and connect to a headset. Withstands 6 foot drop to concrete across the operating temperature - which is a stress test of the mechanical design and a 2000 x 1meter tumble spec which is an endurance test for the mechanical design. Real-time data capture automates and error-proofs business processes. Barcode Datalink carries all sorts of accessories for the Motorola MC9090 range of mobile computers. There are holsters, protective boots and a variety of cradles and battery chargers. Contact us for more details and pricing. Click the button to view all the options. I've just unpacked my new MC9090 and the barcode scanner doesn't come on. Why? Download and install DataWedge V2.02.03 first. How do I warm boot the MC-9090? Hold down the power key for at least 5 seconds and then let go. How do I cold boot the MC9090? Hold down the 1 and 9 keys along with the Power key. Then let go. * Please note that this will erase programs on the device, reset the clock, region and wi-fi settings and you will have to reconfigure and reinstall your applications. Do this only as a last resort if a warm boot does not fix your problem. How do I connect to a Wireless LAN?